Cork Councillor Laura McGonigle has landed herself in hot water after posting a message on her private facebook page on Saturday morning. 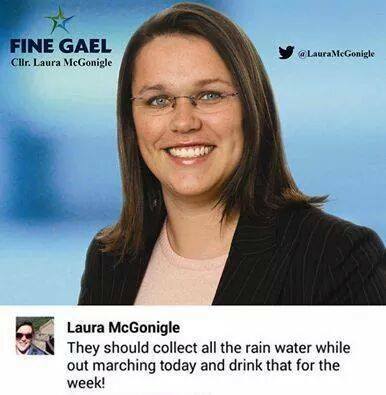 McGonigle posted prior to the water tax protests “They should collect all the rain water while out marching today and drink that for the week !”. Today the facebook account was closed and the following message was posted on her Fine Gael page. I wish to clarify a comment posted by me on my private Facebook account over the weekend. A suggestion had been made to me earlier that morning that as a nation we should not pay for our water as there was plenty of rain. I was attempting to highlight that rainwater is not safe for drinking and costs the State in the region of €1.2bn per year to treat. I realise that my comments were open to a misinterpretation that I did not intend, I apologise for an offence this may have caused.